ONE STEP AT a time and she’d make it. Kenderly’s hands shook, rattling the keys as she tried to push one into the car door. She just needed inside. She saw the man who had let her in the gate earlier. He held up his hand for her to stop. No way. She couldn’t stay with all the guns and…death. She ignored him and sat behind the wheel. He put his finger in his ear, then looked at her again and began running. His rifle bounced across his chest until he held it against his ribs. The man with a rifle yanked the door open and grabbed a fistful of her hair, tugging. She'd forgotten to lock the door, but somehow she’d already put on her seat belt so she was stuck. He reached across and popped the lock, then yanked again. All she could do was grab his wrist to keep her hair attached to her head. The image of the dead women fixed on the back of her eyelids. Every time she blinked she saw the blood and gore. He pulled her hair to get her to move, but she was about to be terribly sick. With blurred vision, she leaned forward and lost what little was in her stomach. The man hopped out of her way. Hearing more fighting above her head, she continued to wretch. Someone pulled back her hair, put an arm around her waist and helped her stand. He led her off the white gravel drive. Past the man who had yanked her hair, now unconscious on the green grass. Its cool shaded lushness registered under her bare feet. As weary as she was, that popped her head up. Petrified, she connected with a pair of jade-green eyes, sandy short brown hair, and a casual self-confident smile that didn't belong in her surreal afternoon. Gorgeous. Absolutely the type of man she wanted to be with any other time. He dangled her shoes in front of her, and she slipped them on. Yes. But she didn’t think she said it out loud. She straddled the back of the motorcycle in her short skirt and heels. Two large, strong hands grabbed her thighs, pulled her closer and placed her feet on two metal rods. Her sequined skirt was up as high as it could be without revealing anything, but now wasn’t the time to care. 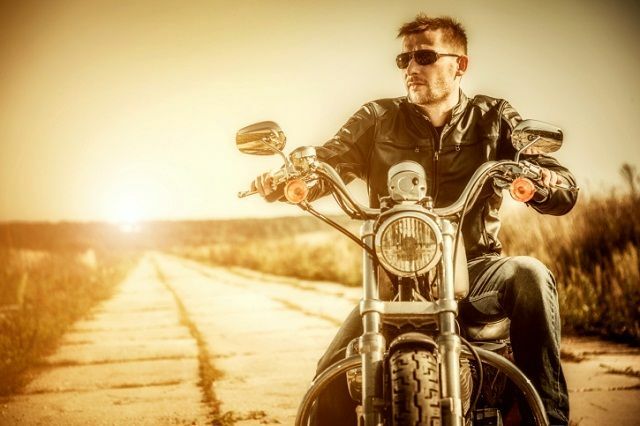 The motorcycle sprang to life, and her arms shot around him. There wasn’t any give to his body when her fingers locked together across his hard abs. She closed her eyes and buried her face against his black jacket. She wanted to see nothing, especially the gruesome picture the shooting had left in her mind. The motorcycle screeched to a halt, sliding sideways in the gravel. Her rescuer slowly took off across the field, avoiding the closed front gate. Go ahead and say it. Murders! The man dressed in black had murdered two people right in front of her, then stared open-mouthed as she’d screamed. This wasn’t the killer. His dark green eyes proved that. The man she’d fought with was just as tall, but his eyes were black with hatred. She’d never forget those eyes. They flew over the next small hill, landing hard on both tires. “Slow down before your kill us!” she shouted in his ear. She turned behind them, her hair whipped across her face. Sure enough, a black SUV bounced over the rolling hills of the Texas lake country. The motorcycle skidded, and she held tighter. If the men shot at them, she’d be dead. Period. The trees were so thick she didn’t think they could get through, either. He slowed a little, but zigzagged, tilting them from side to side, making her want to put her feet out to drag along the ground. She kept them secured and kept her body smooshed against the stranger’s back, moving like a second layer with him. Bushes whacked at her legs as they zoomed past. The branches stung but suddenly stopped. The first thing she saw was the perfectly smooth carpet of green. She looked behind them, and no one followed. The SUV turned and followed on the other side of the trees for a few seconds before turning away. Someone shouted, making her look forward. They were on a golf course, bouncing yet again over the greenway to a cart path. Once there, the ride was smoother, but her hero didn’t slow. If anything, he went even faster. It was a Friday night at dusk, and the golfers were finishing their rounds. So they were few and far between on the earlier holes they’d zipped past. Kenderly only relaxed a little. This time when her eyes closed, they were burning with tears for Isabella. No one deserved to die that way. He was right. Her hero. They couldn’t stop. Her unnamed rescuer popped over curbs, into a parking lot and on to the street. He ran stop signs, passed other cars as if they were standing still and just kept going. Once on Highway 71 leading back to Austin, he wrapped his long fingers around her thigh and gently tugged her close again. His subtle message was that their wild ride wasn’t over. She moved, resting her head once more on his back. They rocketed through the wind, which didn’t allow for talking. 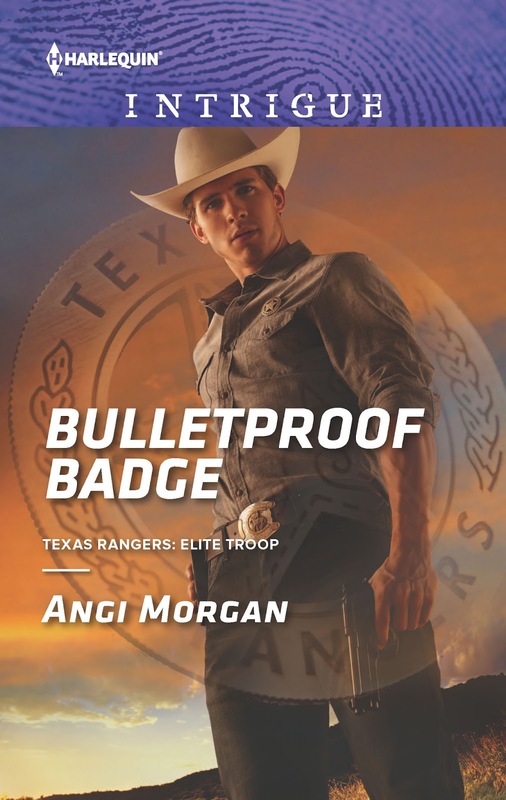 BULLETPROOF BADGE is book one in a four-part series about Company F in the Texas Rangers. Leave a comment to be entered for an autographed copy of BULLETPROOF BADGE (international drawing ends at midnight 1-19). Enter the Rafflecopter drawing for an additional chance at an autographed copy of Bulletproof Badge before it hits shelves (ends 1-31). January 31st. Contestants who enter the Rafflecopter drawing can register for additional chances by leaving a comment on Just Romantic Suspense, click the JRS comment to receive your extra entries. What do you think about the covers & titles? I'm not very good with titles, therefore I try to remember books by covers. 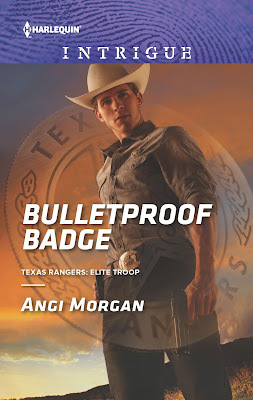 I like the cover of "Bulletproof Badge". It's clean and simple. And I'm glad the Harlequin art department did an awesome job on my covers. Even if I wasn't already planning to read this book, I would have to after reading the excerpt. Talk about grabbing the reading! Can't wait! I forgot to comment on the covers and titles. Both covers draw me in but the titles are only ok. sorry. I'm so glad you enjoyed the excerpt. That's such good news today. Like I mentioned above, the titles aren't my own...but I do think they're strong. Merry Christmas ! I can't wait to read this book, it sounds so good!! This excerpt was amazing, thank you for sharing. Merry Christmas!! Your support is always welcome ! I love this quote where she says " slows down before you kills us! She shouted in his ear." Thanks so much Janice ! I'm so glad it piqued your interest. I think the cover and title are great. The model they used looks a little like Ryan Kwanten and, as a result, the cover makes think of the movie that he was in called Red Hill. If you haven't seen it, I highly recommend! WOOT!! That's terrific Bertha ! I'll have to check out Ryan Kwanten in Red Hill. Thanks for the recommendation. You're welcome. It's a great film! Oh wow! It looks terrific! But it's not surprising, is it, Angi! THANKS SO SO much Joan !! You're the first winner of BULLETPROOF BADGE ! Happy Holidays Angi! :) You always have such great covers and titles! I have a great Harlequin team. Love the covers and also the excerpt. Just love these books ..Hope you have the happiest of Holidays as you so deserve giving away books is so nice. Thanks so much PT !! Love the excerpt thank you. Thanks for stopping by, Mary ! Merrt Christmas Angi. Cannot wait to read your new book. I loved all of it but "His subtle message was that their wild ride wasn’t over." makes me look forward to all that is ahead of them. Woot! That would be correct. What a horrible display of grammar. I guess I hadn't had any caffeine. I love a good cover ... titles I don't pay as much attention to. "Where are you going?" ... "Where they can't"
I like that line, too, Lynn. Sometimes, me (the writer) can't remember writing good lines. IF you're just stopping by... Another winner will be drawn on Wednesday. You need to do one thing . . . choose your favorite line from the excerpt. Best of Luck & Merry Christmas ! We really need to fo now, sweetheart. you coming? is my favorite line from the excerpt. Have a Happy Holidays. You've won the second book giveaway. THANKS FOR HANGING WITH ME !